What Are the Best Online Doctorate in Special Education Programs? A career in special education can be personally and financially rewarding. Even better, it also provides a variety of opportunities to impact the lives of others in a positive way. Yet with a steady job growth rate of 6%, standing out among other applicants can be difficult, especially as employers increasingly select candidates who have attained the highest level of education for top-level positions. 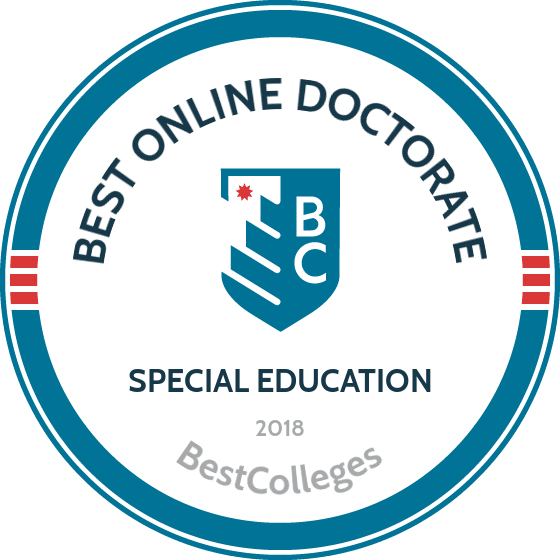 Earning an online doctorate in special education isn't just a convenient, affordable way to achieve your professional goals, it demonstrates to prospective employers that you're serious about helping others through special education. Every school has different admission requirements for online doctorate programs. While all applicants are expected to hold a master's degree in a relevant field, some programs require students to have additional professional experience in related areas. If you're interested in a program but concerned that your work history isn't sufficient, contact an admissions counselor for further information. CAN I WORK WHILE I COMPLETE MY ONLINE DOCTORATE IN SPECIAL EDUCATION? Online degree programs are designed with busy people in mind, and that includes working professionals who want to advance their careers through education. While virtually all online programs can be completed while employed, some course formats and delivery methods are more convenient than others. It's important to take these factors, as well as the amount of weekly coursework, into consideration before choosing a program. WHAT ARE THE ADVANTAGES TO EARNING MY SPECIAL EDUCATION ONLINE? Earning a degree online lets you receive a quality, comprehensive education when and where it's most convenient for you. Whether you're currently employed, raising a family, or both, there's a distance learning program that fits your schedule. Many online degree programs cost a fraction of their traditional counterparts while offering the same rigorous academics and conferring the same credentials as their on-campus counterparts. Ball State University, a public research college in Muncie, Indiana, enrolls more than 22,000 students annually. The school’s online offerings include a doctor of education with a major in special education and five concentration options: policy and administration, applied behavior analysis and autism, teaching and learning, high incidence, or general special education. BSU offers the degree in a blended format combining online and on-campus courses. While a significant portion of the coursework is available online, all degree candidates must complete a residency at the BSU campus of at least 15 credits of coursework. The residency can be completed over two consecutive semesters and gives students the opportunity to concentrate on research and collaborate with faculty. Applicants hold a master’s degree, have a cumulative GPA of 3.2 at the master’s level, and two years of related professional experience. If you live nearby, you can also apply for an assistantship and receive discounted tuition. Concordia has offered quality education to the Chicago area for over 150 years and offers several online degrees. Over 40% of the school's graduate students earn their degrees completely online, and Concordia's virtual graduate programs include a PhD in special education online. Concordia's EdD/PhD in special education leadership is designed for those who want to be educators and scholars, and who want to pursue special education leadership roles in private and public schools. Students in the program can choose between two tracks: the research-heavy PhD concentration and the practice-focused EdD. The curriculum includes courses on special education law and policy, supervision of programs for children with disabilities, community partnerships, and more. The courses are offered in an asynchronous format, making it easy for adult learners to earn a doctorate while maintaining a full-time job. Applicants must have earned a master's degree with at least a 3.0 GPA to be considered. Drexel is home to an online doctor of education in educational leadership and management with a concentration in special education leadership. The online Ed.D in special education requires 60.5-61.5 credits total, divided between 15 credits of core courses, 24.5 credits of research courses, 15-16 credits of concentration courses, and a six-credit dissertation. The special education track includes attention to policy, curriculum and program development, and administration in special education. Multiple internship options in special education or school administration are also available to students. Drexel offers both three-year and five-year plans of study. The three-year plan uses a cohort format, so students progress through courses as a group. The five-year plan allows degree candidates to complete one course per semester independently. While the three-year track offers greater opportunity for collaboration, the five-year track is better suited to students with demanding careers or personal obligations. Hampton University was founded in 1868 in Hampton, Virginia. Today, the school serves more than 4,000 undergraduate and graduate students. Hampton offers a number of virtual degrees at the undergraduate and graduate level, including online doctoral programs in special education. Hampton's PhD in educational management has four distinct tracks: higher education, pre-K-12 education, STEM leadership, and special education. The curriculum includes courses on diversity and equity in education, policy and politics in education, and more. This accelerated program can be completed in just over two years of study. Students can transfer credit for classes with a C grade or better, and can earn credit for military training, life experience, or credit-by-examination. Applicants must have a bachelor's degree with at least a 3.0 GPA and should reside in one of 27 approved states, or the District of Columbia, to be considered. A private Christian college based in Lynchburg, Virginia, Liberty offers a doctor of education in special education that trains educators to assess special needs students and develop strategies for collaboration and classroom instruction. The doctorate in special education online requires the completion of 60 credits. Courses include educational assessment for special needs, learning theory and research, behavior management, and organization and design of gifted education programs. Degree candidates may also add initial or advanced special education teacher licensure to their degree, though this may require additional coursework. While most program curriculum is delivered online, Liberty does require students to attend three to four on-campus intensive sessions. Typically lasting about a week, these campus residencies offer opportunities for in-depth study, classroom learning activities, collaboration with both peers and faculty, and networking. Students with significant work obligations may be able to perform shorter residency sessions during the weekends. Regent University is a private Christian university located in Virginia Beach. The university offers over 110 online undergraduate and graduate degrees, including a doctorate in special education online. Regent offers both a PhD and an EdD in special education. The 75-credit hour PhD focuses on special education research and policy, and prepares students for careers in special education administration and university teaching. The 66-credit hour EdD is a great professional development opportunity for candidates pursuing leadership positions in special education and or careers in advocacy, consulting, and policy,. Both the PhD and EdD are delivered mostly online, although they each require a pair of one-week, on-campus residencies. Each curriculum includes a Christian worldview for educators courses, which examines educational trends and cultures through a Christ-focused lens. Most of Regent's online courses are asynchronous, though some classes employ real-time lectures or chats with class members or professors. Slippery Rock University is home to one of the oldest academic special education departments in the country and offers one of the top online doctoral programs in special education. SRU’s doctor of education in special education emphasizes leadership skills, special education strategies, and content learning. The degree is administered in a blended format, with fully online courses in the fall, winter, and spring and face-to-face teaching courses held on weekends during the summer. Online courses include synchronous and asynchronous sessions, mixing live class meetings and lectures with other assignments and readings. The entire program operates in a cohort format, allowing students to move through courses as a group. Taking two courses each semester, most candidates complete the degree in three years. SRU also allows students to apply up to 12 approved credits from their master's toward the doctoral program. A major public college based in Lubbock, Texas Tech University is home to an esteemed online doctor of philosophy in special education, a comprehensive program that emphasizes teacher education, research, evaluation, and program development. The 90-credit blended degree combines online and on-campus courses, though one academic year of required campus residency courses make the program more practical for students who reside near the TTU campus. The year-long residency requires 12 credits of coursework per semester. Alternatively, candidates can complete three consecutive summer semesters worth nine credits each. On top of core courses, all students complete a doctoral internship. The internship offers the chance to draw connections between doctoral work and professional practices, helping students develop a greater understanding of both areas. Candidates often intern with college special education programs, education research organizations, education service centers, public school agencies, or social service organizations. The University of Northern Colorado began as a training site for teachers in Greeley, Colorado. The school offers 4 distinct online education programs through its extended campus. Northern Colorado's PhD in special education is driven by the idea that learning should be an active, independent experience. The program prepares students for a variety of special education jobs in public and private schools, businesses, governments, and more. The curriculum includes courses in special education administration, autism, behavior disorders, learning disabilities, and more. Online courses at Northern Colorado are delivered through Canvas and are asynchronous, although most classes require students to meet strict deadlines when submitting assignments or participating in discussions. The 77-credit degree can be completed in roughly three to five years. Applicants should have a combined GRE score of at least 297, with an analytic score of 3.5 to be considered. Home to more than 23,000 students, the University of Toledo is a major center of education in northwest Ohio, offering a significant selection of both campus and online programs. The University of Toledo’s doctor of philosophy in curriculum and instruction with an emphasis in special education produces leaders at all levels of education. The Ph.D in special education online requires a minimum of 70 credits, encompassing advanced special education coursework, professional seminars, research skills, and a unique virtual internship that allows online learners to gain professional experience from home. Taking two courses per semester, students can complete the program in four to five years. While all courses are available online, UT requires students to meet a faculty advisor in person twice per year. Doctoral candidates also benefit from UT’s membership in the Division for Early Childhood's Consortium for Innovations in Doctoral Education, which gathers leaders in the special education field to share knowledge. A research-intensive public college in Morgantown, West Virginia University is an education hub serving more than 29,000 students annually. WVU's doctor of education in special education trains students to serve as educational leaders responsible for personnel preparation and professional development at colleges, universities, public schools, or disability services agencies. The online Ed.D in special education requires a minimum of 64 credits. Major courses cover important topics such as professional writing and grant writing, personnel preparation strategies, and leadership career development. WVU’s program also includes several professional practice courses that provide hands-on experience in systems advocacy, college instruction, clinical supervision, empirical research, and service activities. The program completion components include the prospectus development, the dissertation itself, and comprehensive final exams. All online doctorate in special education programs are different. Core courses and concentrations can vary widely from school to school, and depend heavily on program length and format. To help you to select the program that fits your life best, the following sections are designed to provide a broad overview of doctorate programs. Special education law: Providing a broad overview of legal topics as they pertain to special education, this course helps future instructors understand how laws impact students with disabilities, as well as how these students are taught. Topics covered include advocacy, disability law, and ethical issues in the classroom. Intervention assessment: Students who take part in this course learn to assess the educational requirements of special needs individuals according to specific criteria, and implement instructional methods accordingly. Though typically designated as a required course, the class is sometimes offered as part of a concentration for those interested in a career as an intervention specialist. Instructional leadership: This course explores the administrative aspects of special education instruction and advocacy. Coursework prepares students for upper-level positions in the educational system by examining concepts in public policy, human resource management, and program development. Instructional leadership courses often include a hands-on practicum component. HOW LONG DOES IT TAKE TO GET AN ONLINE MASTER'S IN DOCTORATE IN SPECIAL EDUCATION? While most online doctorate in special education programs span between 60 and 100 credit hours, some take as little as a year or as many as five years to complete. The length of an online PhD program is dependent on several variables, including delivery format and whether or not it includes a practicum component. The most influential factor, however, is a program's pacing. Designed for busy individuals, asynchronous or self-paced programs allow students to review materials and complete assignments at their convenience. Frequently taught in an accelerated format, students with excellent time management skills can quickly complete these programs. Cohort-based programs are much more structured, and often require students to be online at specified times. These programs stress interaction with faculty and other cohort members, and may include group projects or discussion as part of a curriculum. Cohort-based programs typically take longer to complete than their self-paced counterparts. The best online doctorate in special education is one earned through an accredited school. Accreditation is a process agencies use to ensure that educational institutions operate according to a variety of important standards. Depending on which agency assesses them, schools may be regionally or nationally accredited. When choosing among schools, understanding the distinction between types of accreditation is crucial to your academic success. Regionally accredited schools are typically nonprofit, academically-focused institutions like state universities, while nationally accredited institutions are most often for-profit vocational schools. Credits earned at regionally accredited schools transfer easily to other institutions, while those from nationally accredited schools do not. Many employers will not reimburse tuition for nationally accredited programs. Accreditation also helps the U.S. Department of Education determine which institutions are eligible to receive federal funding. This branch of the government doesn't accredit schools, relying instead on reports from external accrediting agencies. So, who accredits the accreditors? Quality assurance groups like the Council for Higher Education Accreditation (CHEA) ensure that accrediting bodies operate according to standards. Made up of over 3,000 colleges and universities, CHEA reviews and assesses organizations while providing the public with information about the accreditation process and the dangers of degree mills. CHEA's website also maintains an extensive database of accredited schools and programs. Special Education Teacher: Special education teachers provide instruction to students whose disabilities may vary widely in type and severity. By assessing a student's intellectual, mental, and physical needs, they determine the best approach to their student's education and adapt their teaching methods accordingly. Some specialize in teaching particular age groups, or students with particular disabilities. School Principal: Principals ensure that all operations within a school run smoothly as they manage faculty and other staff members, develop a school curriculum, and oversee financial matters. Most principals have accrued years of teaching experience before taking on this administrative role, and some earn their doctorate while employed as a teacher. Instructional Coordinator: Charged with curriculum development and implementation, instructional coordinators ensure that schools employ the most effective teaching methods and maintain high educational standards. Most begin their careers as K-12 teachers. Some instructional coordinators with a background in special education assist in the development of materials and lesson plans for special needs students. Many factors can influence a special education expert's annual earnings. Location, experience in the field, and workplace policies are all variables that may impact an individual's salary, but few have a stronger effect on earnings than education. Using data from PayScale, the following table demonstrates the close correlation between higher education and higher salaries, even among individuals with the same degree of experience. National Association of Special Education Teachers: Offering support to former and current instructors as well as students, this group is the largest of its kind in the United States. Members benefit from access to a vast database of professional development tools, including online courses, board certification programs, and a large reference library. Council for Exceptional Children: Since 1922, the Council for Exceptional Children has championed the success of special education students. Today, members can enhance their skills in education and advocacy through workshops, seminars, and professional training. International Association for Special Education: This organization extends membership to special education professionals in over 50 countries. Students interesting in attending its biennial conference can apply to have their attendance and lodging covered by the Marg Csapo Scholarship. Many students feel overwhelmed when it comes to paying for their degrees. Fortunately, there are plenty of resources available to help you understand your options. By filling out the FAFSA, you can easily determine your eligibility for federal funding through grants, loans, scholarships, and work-study programs. Numerous cultural, regional, and professional organizations also offer scholarship opportunities. Additionally, some employers cover all or part of tuition costs if a program is relevant to the workplace.